An egg yolk is the part of an egg which serves as the food source for the developing embryo inside. Prior to fertilization the yolk together with the germinal disc is a single cell. Mammalian embryos live off their yolk until they implant on the wall of the uterus. The egg yolk is suspended in the egg white (known more formally as albumen or ovalbumin) by one or two spiral bands of tissue called the chalazae. The eggs used for culinary purposes generally come from birds (particularly poultry). Chickens in particular are extensively farmed for their eggs. Duck eggs are also sometimes used and are particularly suitable for use in baking cakes. As a food, yolks are a major source of vitamins and minerals. They also contain all of the egg's fat and cholesterol, and almost half of the protein. 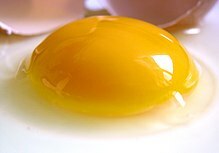 If left intact while cooking fried eggs, the yellow yolk surrounded by a flat blob of egg white creates the distinctive sunny-side up form of the food. Mixing the two components together before frying results in the pale yellow form found in omelettes and scrambled eggs. Egg yolk can be used to make liqueurs such as Advocaat.